Kohal on live esinejad ja oma dj-d. NB!! LOOSIPAKID! Külla tuleb ka jõuluvana ja et kingikotist oleks midagi võtta palume kõigil kaasa võtta kingipakk väärtusega kuni 5 eurot. NB vol 2! Peol avatud ka baar! Tasumine sulas! 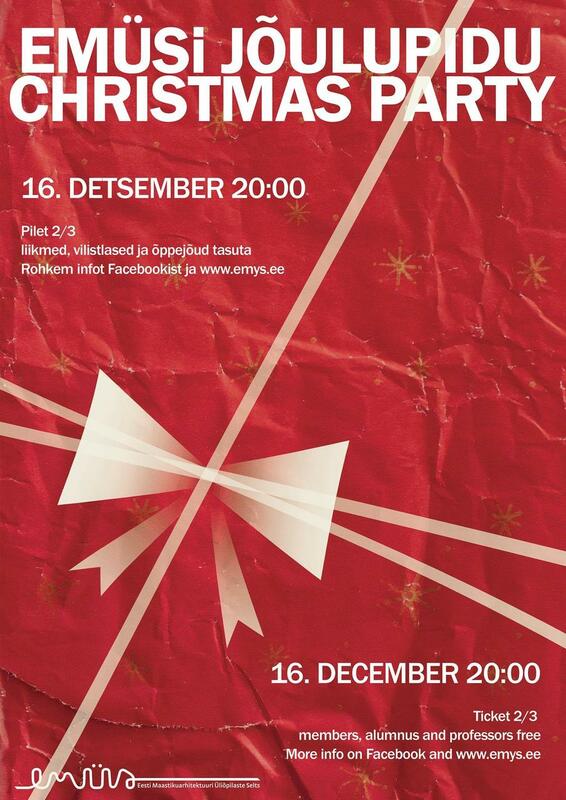 Christmas party for all students of landscape architecture! There will be live performances and also our own djs. NB!! Santa Claus will visit also our party and to make sure that everyone receives a gift, we ask You to prepare a small gift (up to 5 euros). To receive a gift, please prepare a small performance (poem, song, play) for Santa, alone or together with your course mates. NB vol 2! There's also bar at the party! Cash only! NB vol 3! EMÜS's members and alumnus and ofcourse lecturers are have free entrance, for all the others the ticket will be 2 € from advance sale and 3€ on the spot.